Hurray! It’s the last episode! I was so happy that the drama was over that I didn’t even mind that the series signed off with such a strange and vaguely depressing ending. I’m thinking/hoping there won’t be another year at Kirin, so maybe I should savor this graduation as much as possible. Considering that Shin Hye Sung (Kang So Ra) was the ostensible lead in this drama, it was a little surprising that she was barely in this episode. Surprising, but not unwelcome since she has been pretty annoying lately. The drama obviously thought it struck gold with Rian’s (Ji Yeon) dance since it showed it again in its entirety, this time with much needed assists from Park Soon Dong (Yoo So Young) and Teacher Hyun Ji Soo (Kahi) – nobody puts Sugar Cube in a corner. Would the drama have been better if it had centered around them? Ah, it’s useless to think of these things now. I admit, though, that Rian’s performances were better than anyone else’s – JB (Im Jae Bum) fell and messed up his knee again, and Jin Yu Jin (Jin Woon) was rude. When JB went down my first thought was, Wow, JB is a fool. Then I thought, Wow, Hye Sung brings misfortune on all those connected with her. I don’t really get what the point of crippling JB like that was, other than to make his life super sad and the drama very depressing. No more idol dreams for JB. Yu Jin’s flake out came from him realizing that he still just wanted to be a two-bit rocker, so why not. I never really got much of an internal struggle from him about the whole rock vs. pop thing, so his very calm choice was not that dramatic. No more idol dreams for Yu Jin. We flash forward 8 months later to graduation and we learn that while Rian won the audition, she wanted to be part of a group so everyone was a Super Idol. This graduation ceremony was only enlivened by Hye Sung’s cold letter to everyone in lieu of her presence – what a cruel woman. But everyone seemed happy as they took pictures. I would have been fine with an ending here, but no, we had to jump ahead 8 years just to see everyone be even unhappier than before. JB has become an ahjumma and a music producer since he can’t dance anymore, and for him it was dancing or bust. Rian is a more successful something – I don’t think even the drama really knew what happened to her. Poor Soon Dong has become a relationship guru that basically means she acts like she’s still in high school except she doesn’t go to classes anymore. Her idea of helping Si Woo (Park Seo Joon), a now popular drama actor (of course he would go into acting), with his Nana (Hyo Rin) and Park Hong Ju (Kim Ji Soo) problems is to tell him that he should get out of the way of this successful duo. Yu Jin is following in the tradition of Counselor Ju and has become a failed rocker-turned teacher whom his students don’t even like that much. Hye Sung hasn’t been back to Korea in, like, 8 years (so cold) and is now a fancy Broadway producer (so much for songwriting). I think the students who had the happiest ending were Jung Ui Bong (Jr.) and Lee Seul (Jung Yeon Joo) – they are now together and run a dance academy which is churning out many pop idols. Like father, like daughter. 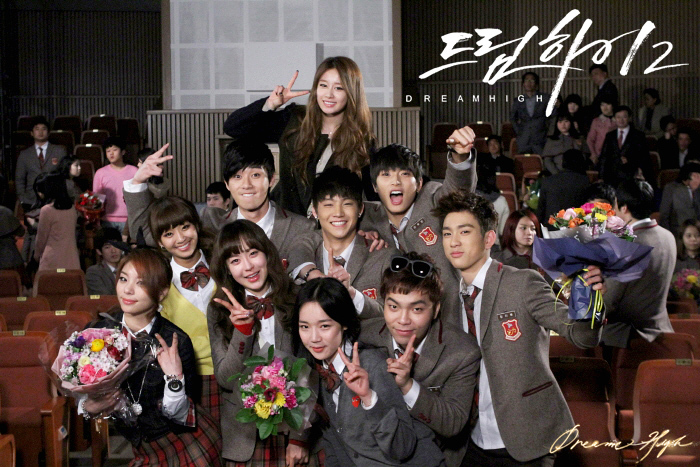 They are all brought together one last time, including Hye Poong who is now a student at Kirin (I guess she has no inappropriate relationship with Teacher Jin Yu Jin), because Hye Sung, Yu Jin, and JB wanted to put together one final musical, Dream High, which involved them saying depressing things and then doing a rendition of the original Dream High theme which made me miss it a lot. And so ends the glorified talent show that was masquerading as a drama. Anyong, Kirin. I don’t need a dazzlingly happy and fake ending to all of my dramas, but this downer of an episode was one of the lamest things ever. The message of the drama became, Sure you can dream high, but it probably won’t work out for you and you’ll end up in your mid-20s yearning to go back to high school and relive your glory days. If there is a more depressing message than that, I’m pretty sure this drama would have shown it. No one’s original dreams came true, and I actually didn’t find this a natural conclusion. It’s like the drama went out of its way to make sure no one succeeded so that everyone had at least one big regret. If they wanted this drama to be a warning to all those idol wannabes out there, I’d say well done. Who would want to be an idol after watching this? And that was it for the romance? Seriously? 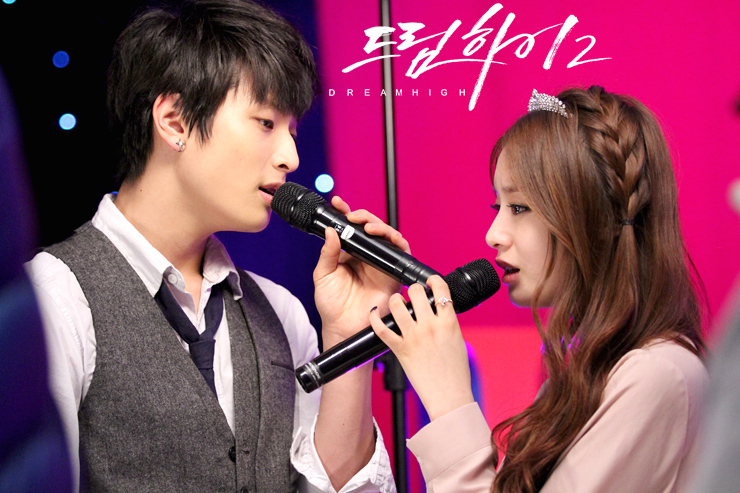 I know the first Dream High didn’t really focus on relationships (since they got in the way of Grammys), but compared to this season it was a sweeping and swoon-worthy love story. And I swear Yu Jin was initially meant to be the first guy and get the girl (it’s the K-Drama law), but I guess JB took over – he wins, since at the end it looks like Hye Sung and JB might get together after all. This reminded me of some earlier shows where it was less formulaic and the main guy was liable to change at a moment’s notice, like Hotelier or even the slightly more recent Sweet Spy – both dramas I didn’t really like. But that means Yu Jin kind of got shafted in love and in life. Whatever. I’m over it. I probably liked the two female teachers the best – they should have taught their kids more. But not even their brief moments could save this drama. And why cast the great Kim Jung Tae if you’re just going to waste him like that? And there was far too much JYP. He should have focused on his new album and his restaurant in New York. This whole drama was kind of a mess, though. Weak writing, weak acting, and weak performances all combined to make for a pretty weak drama. There were too many people, so everyone was kind of wasted. Why was Park Seo Joon even in this drama if they weren’t going to do anything with him? I got the impression that the screenwriter either deviated from the original storyline for whatever reason, or else there was no overarching vision and the scripts were just put together haphazardly. I hadn’t thought much of the first one, but this season made it look like art, and the original cast all seem like thespians. I even missed Woo Young as Jason – Jason! I could judge this drama on its own and stop comparing it to its better, prettier older sister, but that might even make me think it was worse than I do now – the residual goodwill helped me see this drama in fuzzy, flattering lighting. Kang So Ra might be a good actress, winning a Baeksang recently and all, but she was terribly miscast in this role and kind of dragged the whole production down. She just got really unlikable all of a sudden – I mean, I suddenly really didn’t like her. I can’t even get mad at any of the idol actors since what can you really expect? I don’t know when I started to actively hate this drama, but maybe it was around the beginning. I’m prepared to forget this drama ever happened. I like to think of it as graduation. Since the last episode was so weird and fragmented, I thought that this drama might have been saving something dazzling for the last two episodes. Instead I got an episode where Rian did a pretty lame version of a Beyoncé dance (Teacher Hyun Ji Soo would have done a way better job) and the kids started thinking about life beyond Kirin. I might have missed it, but something important must have happened in this episode, right? Because by the end it felt like there were no more students left at Kirin. I don’t really get what’s up with JB (Im Jae Bum) – is he just going to eat for the rest of the drama? Now I love the traditional eating scene in Korean dramas – sometimes it’s my favorite part – but when he does it I feel the urge to look away since it seems so private. JB really eats well – it’s nice that he looks so well-fed and well-rested. Maybe that’s why he’s so sharp and able to be super sleazy and manipulative. For it looks like he’s out of the hospital and strong enough to keep Shin Hye Sung (Kang So Ra) by his side and to walk by himself. He can only dance on one leg and he can’t run that fast – but fast enough to reach Hye Sung at the airport before she leaves for a songwriting internship abroad. I think they’re trying to make his romance with Hye Sung sweet, but all I’m getting from them is that she’s his indulgent nuna who lets him guilt trip her about his leg (how romantic) and who eats with the chopsticks that must taste like manhwa. I just don’t believe in their love, so when they started hugging and crying when they parted, I kept waiting for the punch line. Even after the credits started rolling, I was waiting for them to explain to me what this meant. One of the reasons I can’t believe in the JB-Hye Sung couple is that I’m still convinced that she likes Jin Yu Jin (Jin Woon) and is just being difficult right now. I’ve been watching this entire drama thinking Yu Jin was the main guy. He is, right? I guess this drama isn’t going by the conventional standards of normal K-dramas, and I’m usually all for that provided it’s done well. Here, it’s not. And now the Rian (Ji Yeon)-Yu Jin friendship is just kind of nonsensical. Am I supposed to understand that Hye Sung really doesn’t like Yu Jin because she doesn’t feel anything watching all of the skinship between the two of them? Or what? The only interesting thing I’ve gotten from JB and Hye Sung is when he told her that since only she broke up with him and he didn’t agree to it, they are still together. His JB-logic explains almost every Korean drama I’ve ever seen now – this must be what every second lead believes. I don’t know about Hye Sung’s Rubik’s cube explanation for her appeal compared to Rian’s: Hye Sung is more appealing the way an unsolved Rubik’s cube is – you feel like you could help. Ok. I’m going to need a better explanation than that, but I understand that this is all I’m probably going to get at this point. This is the weirdest school. Kids leave for Berklee as if it were no big deal, kids become managers, and I don’t know what. There’s not really a lot of school going on as the kids start trying to get tv gigs and auditioning for world tours. The one class they had in this episode involved them saying mean things about each other – I guess that was realistic. I think the only person who understands what is happening at Kirin is Super Producer Shin Jae In (Yoon Hee Suk) – why else does he look so happy and smug all of the time? 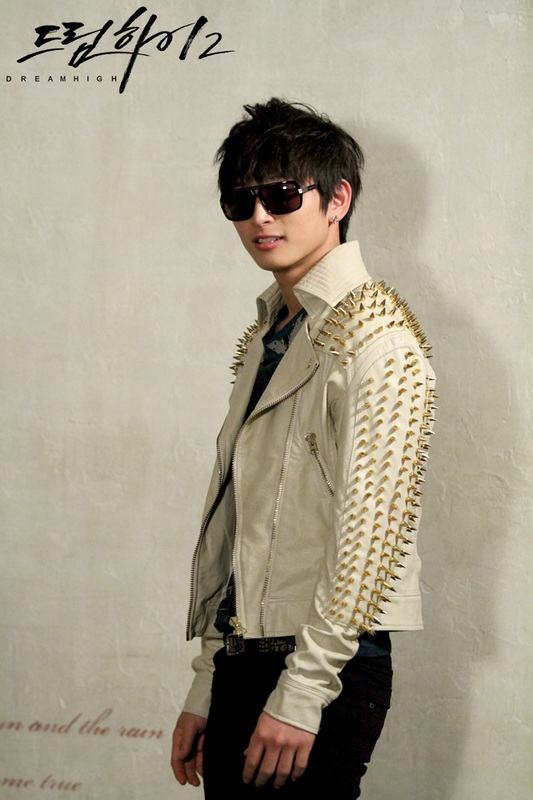 And does he have a beef with Hye Sung? He says studying abroad is a priceless opportunity for her, but doesn’t he just want to get rid of her? He doesn’t seem to trust her around his super idols. And missA had a cameo and talked to the new group Super Idol in passing. 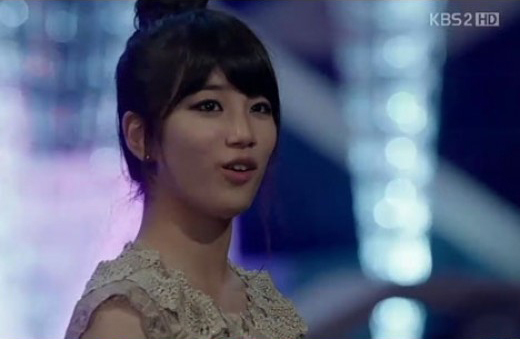 Seeing Suzy just reminded me that the first Dream High was better than this one. And all of sudden everyone is a super idol, except Park Soon Dong (Yoo So Young) and Lee Seul (Jung Yeon Joo). So everyone’s a winner? If Jae In had just wanted to weed out Soon Dong and Seul he could have told them instead of having an elaborate audition process. And when did Soon Dong become the poor man’s Hye Sung? I’m not expecting much for the last episode, but I should stay positive. Dream high, right? This felt kind of like the second-to-last episode in that nothing really happened. This drama continues to astound me with how weird and random it is. Are they trying to make it just like high school? Or maybe they just wanted to take things slow in order to give JB a chance to recuperate. I was worried that they would make JB (Im Jae Bum) unable to dance again because of his injury, and of course they did. That’s what he gets for saving a kid? Honestly. I hope it’s not permanent – is this really the kind of drama they want it to become? But this was still less of a downer than the first Dream High where Song Sam Dong was like a modern-day Beethoven with K-Drama levels of angst. And I got a little confused – JB does remember Shin Hye Sung (Kang So Ra) breaking up with him, right? He was still so happy to see her, and didn’t even seem to blame her at all for indirectly causing his accident. I guess super idols can’t be petty – idole oblige. And Eden lives on – everyone came to visit JB, including Si Woo (Park Seo Joon) bearing his standard Si Woo Care Package – maybe he doesn’t like Nana (Hyo Rin) that much if he gives the same kind of treatment to everyone. She probably doesn’t care since she and Park Hong Joo (Kim Ji Soo) are rocking couple backpacks now (what will they think of next). I guess one upside to this accident was that Rian (Ji Yeon) got over her issues and admitted to herself and to JB that she never got over him. Now she promises never to leave his side, which she interprets to mean that she can use his sleeping, inert body as a writing desk. If she’s writing a song inspired by him, does that make it less insensitive and rude? 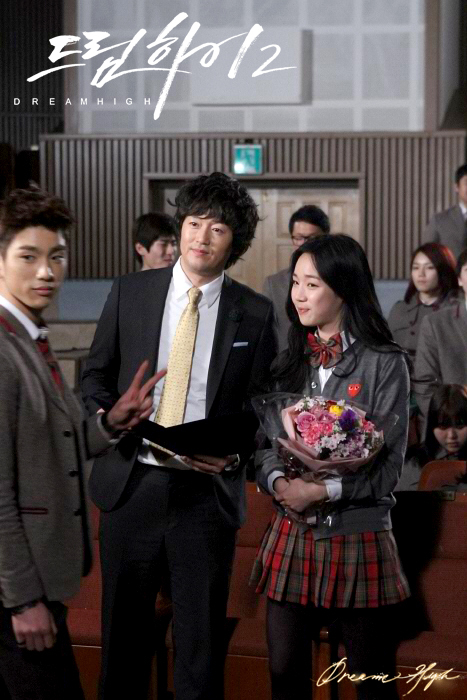 Jin Yu Jin (Jin Woon) took the opportunity of JB being out of commission to try and get closer to Hye Sung as she was grieving, but she just brushed him aside. It was kind of funny to see them wrestle over whether she would leave her room (he says yes) or not (she says no). My money was on Hye Sung, but of course Yu Jin had to do something with her in this episode. He awkwardly carried her out of her room, thereby fulfilling his day’s quota for Hye Sung Interaction. When he wasn’t hovering around Hye Sung, he was hovering around his mother (wow, not attractive, Yu Jin), who is running a snack shop. I was surprised that they made Rian the one to reconcile Yu Jin with his mom since usually the first girl has to do that, but it does make more sense to have Rian do it since she is his soulmate, in a way. 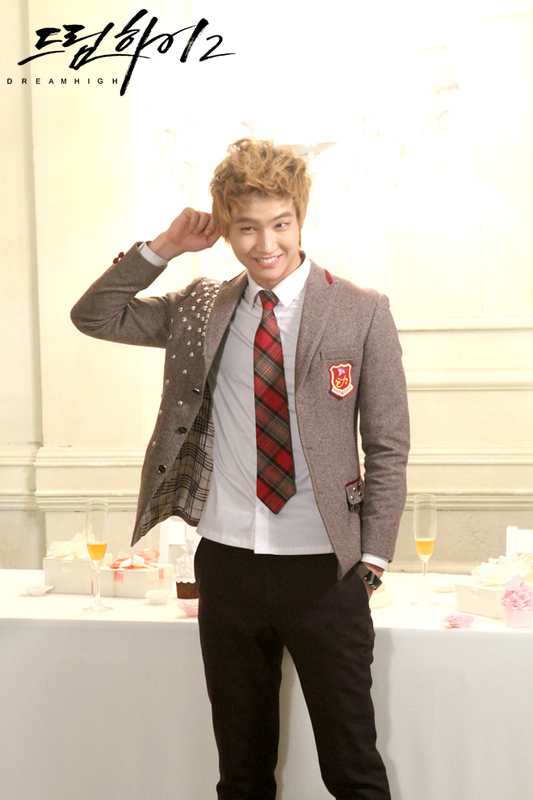 Or at least the male version of Yu Jin, just as Hye Sung is kind of the female version of JB. Kind of. It looks like he’s forgiven her, and it was nice that Yu Jin and Rian could share having the worst mothers ever. I guess Hye Sung wasn’t completely useless since she managed to intimidate Super Producer Shin Jae In (Yoon Hee Suk) into doing exactly what she wanted. Maybe he saw her spar with Yu Jin and decided he wasn’t going to pit his strength against hers. She asked to give up her audition spot to JB (about time) and have him and Rian sing that duet she had written for them, “Together.” They did this at the audition and it was supposed to be wonderful. I couldn’t help but side with Hye Sung’s embarrassing kid sister Hye Poong (No Jung Ui), who had come just for the audition, when she complained in that carrying voice that only annoying little siblings have, about how lame it was that Hye Sung wasn’t going to sing at all. Her father shushed her, saying that Hye Sung was a songwriter, not a singer. That doesn’t change the fact the she kind of brings death and destruction wherever she goes. She’s like the Phantom of the Opera and JB is her Christine. Or not. Even Lee Seul (Jung Yeon Joo) got some closure and came to terms with her daddy issues. I think it was a missed opportunity not to have her and Jung Ui Bong (Jr.) sing Big Bang’s “Dirty Cash” instead of that kiddie one they opted for (even if that song, TVXQ’s “Balloons,” was from Jr.’s audition days), but oh well. It looks like President Lee is just a giant teddy bear after all, though I’m not sure how he’ll react when he finds out that Ui Bong is after his precious daughter. 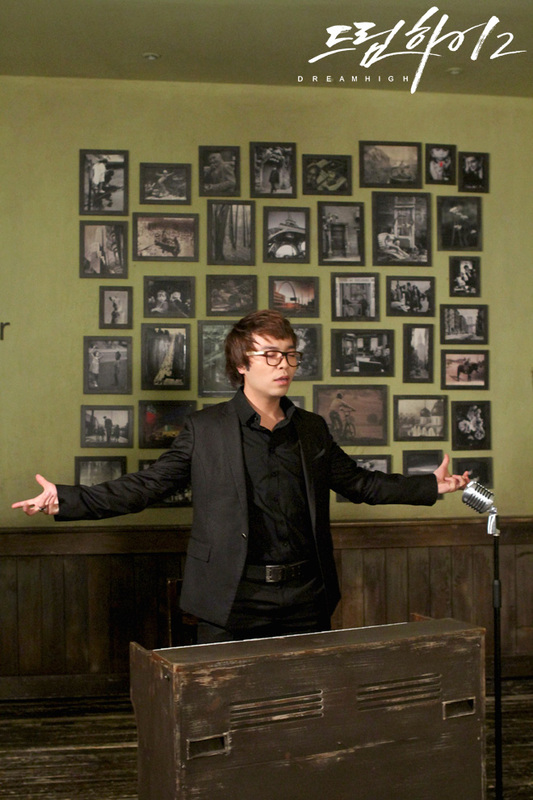 Kim Jung Tae is so much better at playing someone goofier like this than a full on meanie. Even the ahjusshi in Killer Girl K was nice. Ok. I’m not sure where they’re going to go from here with two episodes left. It would be nice if they showed Hye Sung fretting over Yu Jin, but one measly episode won’t really make up for the fact that she’s been kind of ignoring him for the entire drama. Even Go Hye Mi was more involved in Song Sam Dong’s life. There aren’t really any other loose ends to tie up at this point, are there? At least there were NGs at the end of this episode. Bloopers always make things a little better. Ok, weird episode. There has been a patchwork quilt-like quality to this drama, and episode 13 was a perfect example. You had some dancing, some singing, some tears, some love drama, and some near death experiences. Doesn’t everything feel like near death when you’re in high school? In case we thought we had misheard, JB (Im Jae Bum) really was disqualified from the Super Idol competition for choosing puppy love over superstardom. 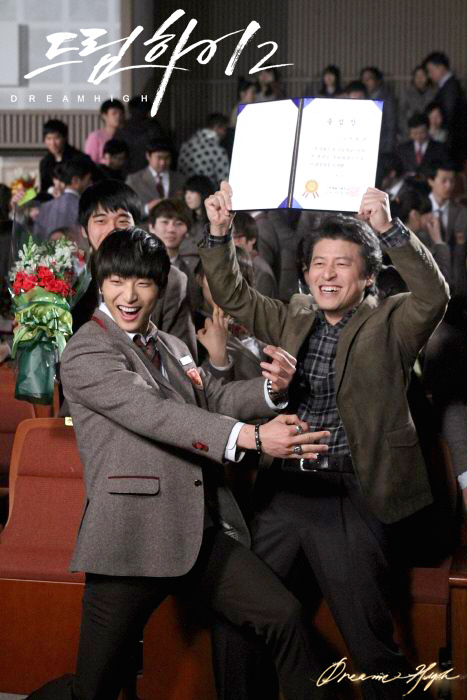 I’ll give it to President Lee (who’s such a softie for his daughter Lee Seul – it was so cute seeing him watch his daughter’s performance over and over and thinking she was the best thing ever) – when Hye Sung’s involved, a girl who doesn’t even seem that into JB, those don’t seem like equal options. JB was really classy about the whole thing, even congratulating Jin Yu Jin (Jin Woon) for winning. But everything is obviously not ok for JB – he dyed his hair back to black. When an idol does that, you know something is wrong. Since Shin Hye Sung (Kang So Ra) had extra credit points from her last successful mission, she wasn’t eliminated which only made everyone at Kirin hate her more. She was subjected to girl gang-esque bullying, and had to be rescued by Rian (Ji Yeon) of all people. See, this is where is becomes really apparent that Kang was miscast. What part of her looks like she would take that bullying lying down? It looked like she was raring to go when those girls tripped her – I could totally see her smacking them around a few times before making them her lackeys. She also looks like she could eat Rian for lunch along with uncooked ramen, so it was highly improbable that she would need Rian’s help on how to be tough. This girl does math problems to calm down – you don’t mess with someone like that. And those Kirin kids are weird bullies. They said she must be a gumiho (nine tailed fox) for her to have seduced JB like that. Was the drama trying to keep things PG, since I can think of a lot better words to use than gumiho. Maybe Kirin kids are just wholesome like that. But even Super Producer Shin Jae In (Yoon Hee Suk) was mean to her, pretty much telling her that JB was disqualified because he liked someone lame like her, since he was too talented to lose based just on skill (did Hye Sung really think that JB could have lost based on talent? I thought she was supposed to be smart). I know I shouldn’t have thought it was funny, but Shin Jae In really looked like he was disgusted by this nasty girl getting in the way of a Super Idol. I wonder how the producer would feel knowing that this same nasty girl was the driving force behind Yu Jin’s sudden desire for superstardom. Yu Jin at last admitted to himself and Hye Sung that he liked her, and that he was sorry. Wasn’t that classy of him? I just wish he hadn’t done it after he had seen her get scary hate mail (just like Hermione!). The mutilated teddy bear was gross, but I think Wild Romance kind of became the gold standard for wacko anti-fans. 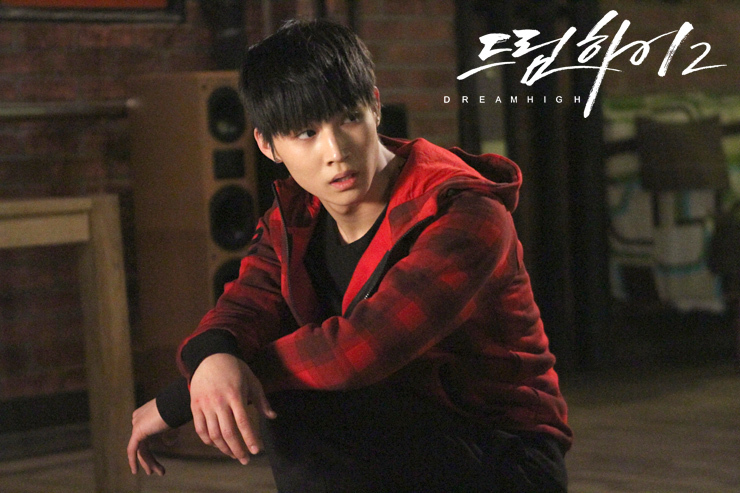 He also later admitted to Principal Counselor Ju (Kwon Hae Hyo) that Hye Sung might be the reason he’s doing everything – trying to beat JB, trying to become a famous idol. The counselor was kind of useless since he just started to reminisce about his own successful love life, but I guess the important thing is that Yu Jin’s put it out there. Poor Yu Jin, thinking that he has to become an idol to win Hye Sung. How can she be so cold to Yu Jin-ah? Who does she really like right now? She didn’t even think of JB right away when she was thinking of the person who was closest to her, so maybe that should give her a clue. Honestly, this drama hasn’t handled the love triangle very well. Even Petit Petit Muse had a better one, and that involved a dog-like creature from another dimension who made clothes. 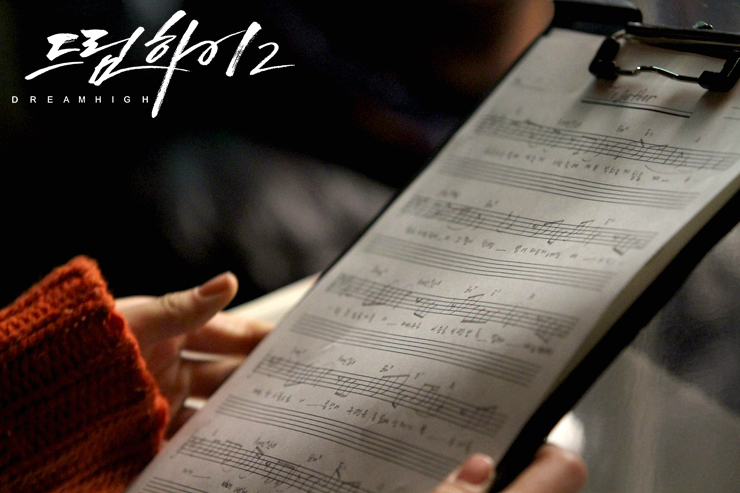 Come on, Dream High! 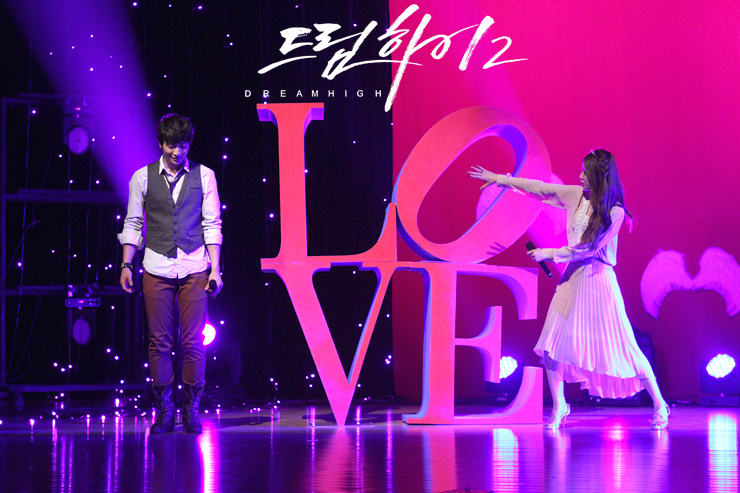 Instead of having a more developed love story, this episode had another random scene involved the kids “acting” in order to prepare for the last super idol audition in which they would have to move one person with a song. This was notable because it was like a highlight reel of popular dramas, including Secret Garden, Dream High, and My Lovely Sam Soon. Kang So Ra did a pretty good impression of Kim Sun Ah – is that the kind of woman she’s going to become? Will she make better dramas if she does? The classroom scenes are a little strange, but at least they showed that Yu Jin and Rian (who really has the worst mother ever – she even got arrested in this episode for selling knockoffs in her daughter’s name) get along really well and are having fun. Someone should in this drama. The only other people are maybe Si Woo (Park Seo Joon) and Park Hong Joo (Kim Ji Soo), who both seem to have forgotten about Nana (Hyo Rin). In the meantime, JB went through a kind of existential crisis in which he assumed his alter ego of Jang Ujae (he is two people! 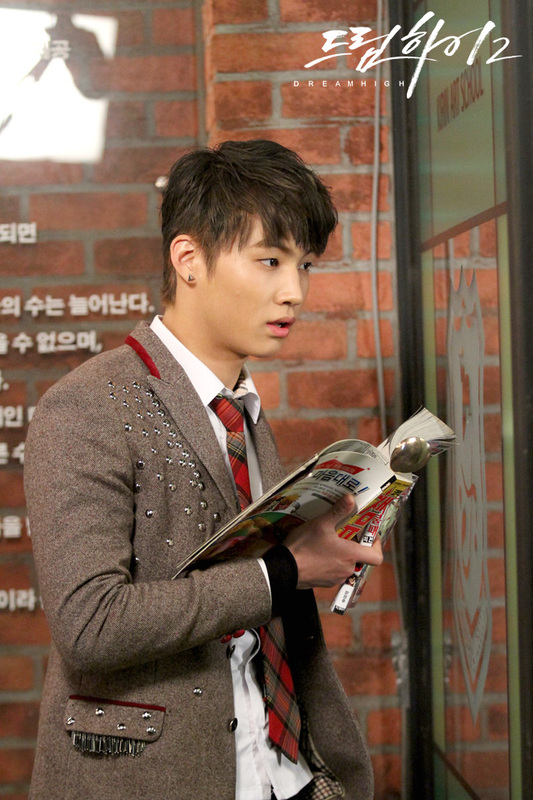 ), the boy who has black hair, reads manhwa, uses a spoon as a bookmark, and waits for Hye Sung after class. But the true low point he hit was when Yang Jin Man (JYP) told him he looked so plain now that even someone like Jin Man looked better than him (um, no). JB seems to be sleeping through most of life (is Hye Sung that boring of a girlfriend? ), but there was something mysterious about that too. At first I thought he was just catching up on some much needed rest, but his roomie Si Woo told Hye Sung, whom he obviously doesn’t approve of (he’s racist! ), that JB had been getting in late every night, but he thought he had been with her. So she took a page from Rian and lurked, and discovered his secret: he may be mild-mannered Jang Ujae by day, but by night he is a killer dance machine with countless breakdance moves in his arsenal. It reminded me of the fairy tale “The Twelve Dancing Princesses/The Worn-Out Dancing Shoes” and that’s a good thing. It would have been even cooler if JB was sleepwalking his way to the studio for some crazed dance parties, but I understand that wouldn’t be very realistic. 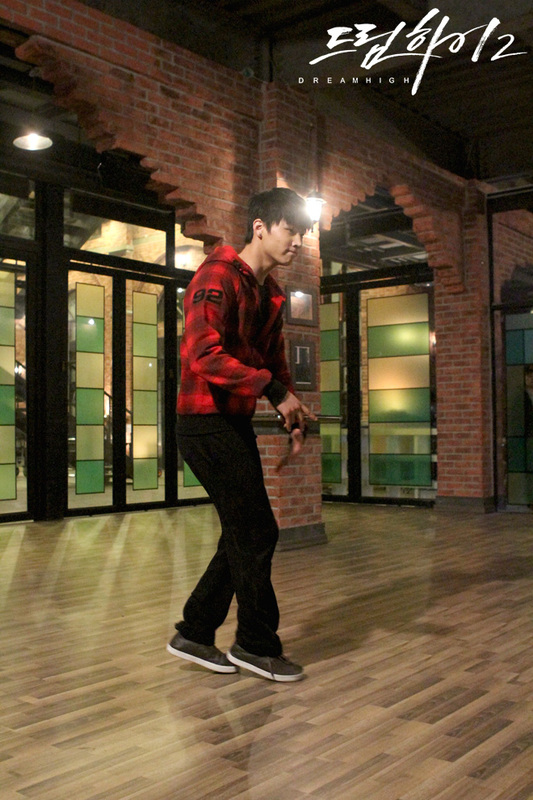 It’s sad to know that he’s obviously not handling being benched very well – he’s cheating on Hye Sung with Dancing. I know who I’m rooting for. This, coupled with what Rian told her about his dating life affecting his idol dreams, caused Hye Sung to do the “right thing” and break up with him. Because stars are like Monets – they only look good from afar, but up close they’re a big old mess. She planned a whole date just so she could tell him that she wasn’t interested in dating a loser who didn’t sparkle anymore. I know she was trying to be nice by being mean on purpose, but it just came across as super harsh. Remind me why he likes her again? Not even the song she had written for him called “Together” could soften the blow, especially since it was a duet she intended for him to sing with Rian (it was the least she could do after stealing most of Rian’s lines). He was understandably distraught and ran after her, only to get into an accident when he tried to save a little kid from getting hit by a truck. We don’t know how serious the damage is, but we do know he now has a cut on his pretty face. Way to go, Hye Sung. It’s starting to feel less and less like Hye Sung’s show, and more a drama about the two fair rivals JB and Yu Jin. And I guess that’s ok since Hye Sung wasn’t really fitting in anyway. In this episode (12 already – where does the time go?) Yu Jin figured out he was being used, while JB discovered just how dangerous dating Hye Sung can be. 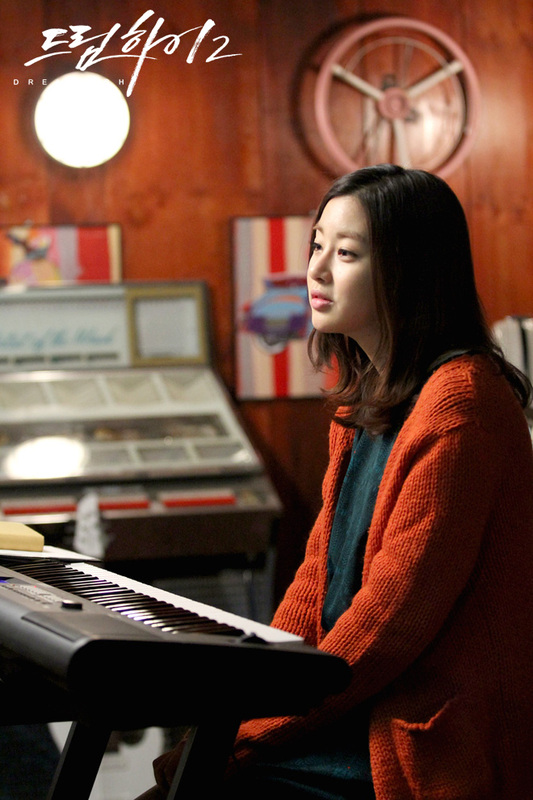 After JB (Im Jae Bum) got over his cold feet and attended that weird rose proposal ceremony, Shin Hye Sung (Kang So Ra) actually agreed to be his singing partner, which somehow also meant that she agreed to be his girlfriend. No one really approves of their union, but they’re in that honeymoon stage when it doesn’t really matter to them what other people think. Ah, hormonal high school romance. They indulged in the typical drama fare, playing hooky and going on one of those street dates where they revel in being “normal” by eating “low” food and touching live aquatic life. This happens in nearly every drama, really. I’m not sure how I feel about how Hye Sung paid for everything – she kind of fits the role of sugar mama pretty well, I think. And their date even culminated in a starlight kiss – JB really likes her cheek. But after what was supposed to be a sweet day for them, you know that their relationship can’t last for very long. I don’t even mind that since I’m not seeing any good chemistry between them. No matter what they do, she always just looks like his indulgent nuna. Maybe he’s into that. While they were off having fun times, Rian (Ji Yeon) and Jin Yu Jin (Jin Woon) were actually practicing to win the audition. They worked really hard, practicing the tango endlessly – I don’t really get the point of the tango, but whatever. These two at least get along pretty well, maybe because they understand each other. Like, she knew just what she had to do in order to get him to practice more – tell him that he was the pacemaker. There have been worse partnerships in K-Dramas. And for some reason, even though Yu Jin is getting all close to Rian, it still felt more wrong for Hye Sung to put a JB bandaid on JB. What a cheater she is! Maybe it’s because Yu Jin seems more vulnerable, even with all of his mean comments. That Hye Sung is coming across as kind of cold-hearted, right? Before the actual audition, there was a mock photoshoot that became something of a centerpiece of the episode – and why not? Each person had to style his or her partner, and it went down in a predicatable way. Lee Seul (Jung Yeon Joo) and Park Soon Dong (Yoo So Yeong) had the best costumes since they just put the other in what they themselves would have wanted to wear. Though maybe Soon Dong would have chosen to be Tomb Raider too. Jung Ui Bong (Jr.) and Ailee went the Sungkyunkwan Scandal route (which really just made me miss the original drama more – oh, Geo Roh), while Si Woo (Park Seo Joon) and Park Hong Joo (Kim Ji Soo) were a little more involved as a romantic soldier and Elton John, the ladies’ man. Does Si Woo know who Elton John is? Yu Jin made Rian get rid of her black eye gunk and go into Audrey Hepburn mode (so that’s what he’s into – then why does he like Hye Sung?) while Rian made him into a flashy superstar. He even shared his G-minor power with her – he wants to win too. JB’s was the most like a backhanded compliment since he went for a Swan Lake theme and told Hye Sung that she’s really a swan that still thinks she’s an ugly duckling. I thought she had gotten over her ugly duckling feelings. I think he just wanted to see her in a super short dress, but whatever. She was the cruelest since she didn’t even let him get dressed up. What’s a photoshoot without getting dressed up? I don’t get what the Super Producer Shin Jae In (Yoon Hee Suk) – whose promos are strangely riveting to me (who films them for him?) – was thinking as he flipped through JB’s pictures, but I hope it’s something super idol related or else he just kind of looked like a perv. And then the actual audition arrived. I didn’t expect all of the performances to be good, but it was kind of lame that we didn’t get to see all of them. 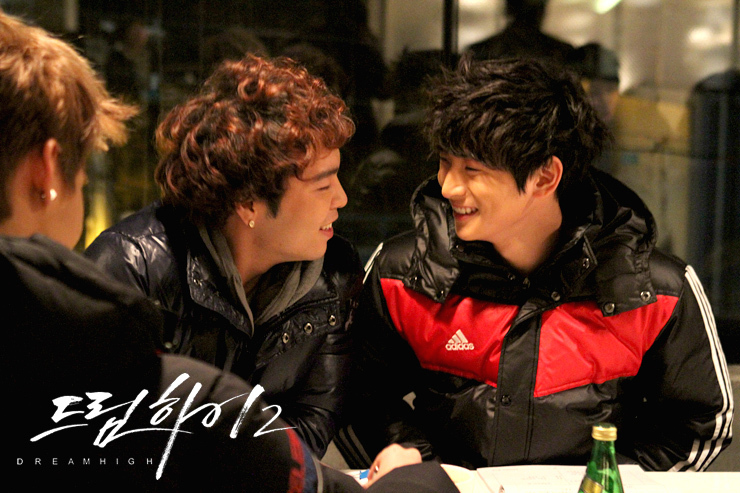 At least Si Woo and Hong Joo Look like they’re getting along better now. 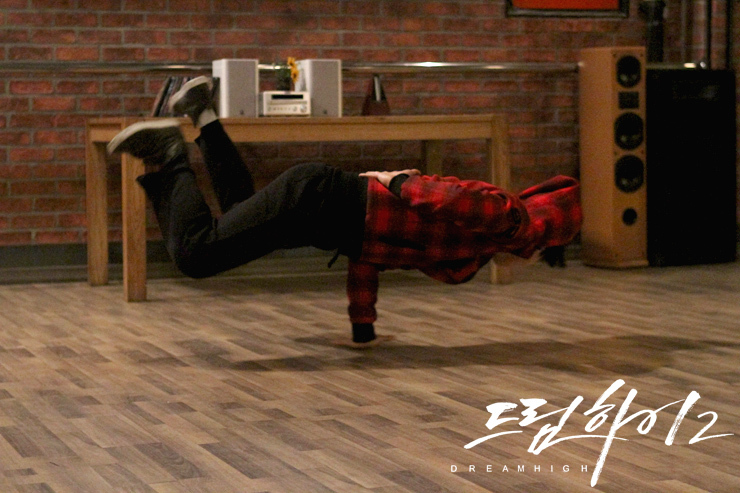 I don’t really get JB’s and Hye Sung’s concept, but JB blew them all away with his crazy breakdancing moves. Always a crowd-pleaser. So it looked like he was going to prove to President Lee that he could date Hye Sung and still be a Super Idol, until Rian and Yu Jin went last. Their concept made a little more sense to me – sleazy 70s folk singers. Rian used the old tears-of-a-rejected-person trick to get people on her side and it seemed to work. One person was disqualified from the Super Idol audition for failing to make a successful proposal – JB. The president and the super producer were going to use anything as an excuse to punish JB for dating a non-idol, so maybe Rian wasn’t so successful. But still, I wonder how long the JB-Hye Sung couple will withstand this kind of humiliation. Especially when they don’t really seem to like one another. The message to JB was clear: that’s what happens when you drop the K-Pendant and play hooky.